As part of our aim to regenerate communities and create jobs we have provided £3.5 million BIF funding towards the regeneration of St Comgall’s on Divis Street. The project has also received match funding from the Northern Ireland Office’s Social Investment Fund. We are delivering the project, which will restore this Grade B1 listed, former school building to create a multi-use community facility, on behalf of Falls Community Council (FCC). FCC recognised the significance of this historic building, which will be brought back into use for the benefit of current and future generations, providing an opportunity to link the past and the present and reinstate the building as a vibrant community asset. The site was occupied by the old Belfast Model School from 1855 until it was destroyed by fire in 1922. The current two storey building, known as Comgall’s Public Elementary School, opened in December 1932 and closed in the mid 1990s. When complete, St Comgall’s will offer a range of rentable space for business start-ups and social enterprises. If you have any queries regarding renting space, please contact Falls Community Council on 028 9020 2030. 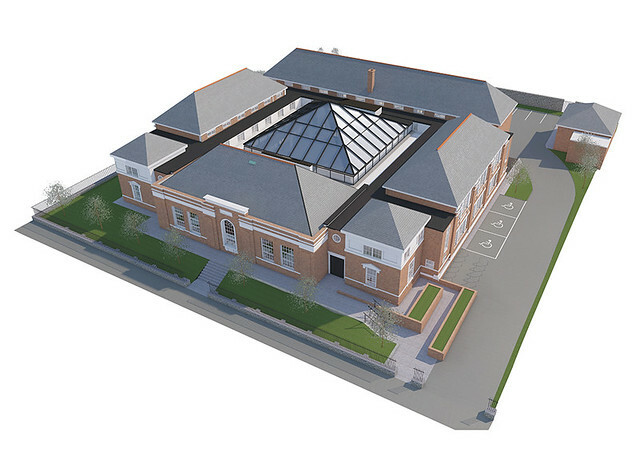 The following video explains how the £7 million restoration of St Comgall’s will restore this B1 listed former school building, transforming it into a multi-use community hub. Take a walk through how St Comgall’s will look when complete in 2020. The following Flickr gallery displays photos of St Comgall's currently and an artist's impression of the completed building. If you are unable to view these photos, please view the album on the Flickr website.